Home » Activity » Blogging » development tutorial » Electronics » Experiment » Hardware » Kwentong Pinoy » Mobile Gadgets » Science Investigatory Project » student counselling institutes » technology news » How to Disassemble MyBro Wimax Greenpacket DV-235T? You know guys I have this MyBro Wimax Greenpacket DV-235T for almost a half year by now. I been using this for blogging, downloading and surfing the web. Unfortunately, the signal of WiMax wasn't good enough to bring me a better connection. So, I came up to dismantle my Greenpacket DV-235T. Then, I use another antenna to make a total of three. Though, it may look like a transformer but it's awesome. The speed of my internet seems great. No intermittent or connection lost at all. I hope you like this one, tweaking the hardware to make it better. Anyway, don't blame me if anything happens while you make a wrong move. All I wanted to share is how to tear-down a MyBro Wimax Greenpacket DV-235T. Please like it and share with you internet friends! 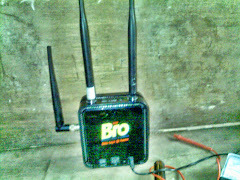 Thank you for reading How to Disassemble MyBro Wimax Greenpacket DV-235T? posted on the website Kwentology if you want to redistribute this article please include the link as the source. Have some kuwento to share? Contact us!